The Atlantic meridional overturning circulation has declined in strength by 15 percent since the mid-20th century to a “new record low,” the scientists conclude in a peer-reviewed study published in the journal Nature. That’s a decrease of 3 million cubic meters of water per second, the equivalent of nearly 15 Amazon rivers. The Atlantic meridional overturning circulation (AMOC)—a system of ocean currents in the North Atlantic—has a major impact on climate, yet its evolution during the industrial era is poorly known owing to a lack of direct current measurements. Here we provide evidence for a weakening of the AMOC by about 3 ± 1 sverdrups (around 15 per cent) since the mid-twentieth century. This weakening is revealed by a characteristic spatial and seasonal sea-surface temperature ‘fingerprint’—consisting of a pattern of cooling in the subpolar Atlantic Ocean and warming in the Gulf Stream region—and is calibrated through an ensemble of model simulations from the CMIP5 project. We find this fingerprint both in a high-resolution climate model in response to increasing atmospheric carbon dioxide concentrations, and in the temperature trends observed since the late nineteenth century. The pattern can be explained by a slowdown in the AMOC and reduced northward heat transport, as well as an associated northward shift of the Gulf Stream. Comparisons with recent direct measurements from the RAPID project and several other studies provide a consistent depiction of record-low AMOC values in recent years. Everything revolves around the question of whether the Gulf Stream System has already weakened. Climate models predict this will be one consequence of global warming – alongside other problems such as rising sea levels and increasing heat waves, droughts and extreme precipitation. But is such a slowdown already underway today? This question is easier asked than answered. The Atlantic Meridional Overturning Circulation (AMOC, also known as Gulf Stream System) is a huge, three-dimensional flow system throughout the Atlantic, which fluctuates on different time scales. It is therefore by no means enough to put a current meter in the water at one or two points. Since 2004 there has been a major British-American observation project, called RAPID, which tries to measure the total flow at a particularly suitable latitude (26.5° North) with 226 moored measuring instruments. This provides good results and shows a notable slowdown – but only since 2004, and probably the change over such a short period of time is mainly due to natural fluctuations and in itself hardly reveals anything about the possible effects of climate change. If you want to look further back in time, you have to look for other sources of evidence. In my view, it is the ocean temperatures that are most likely to solve the mystery – because firstly, there is a lot of good data and, secondly, the AMOC has a dominant influence on sea temperatures in large parts of the North Atlantic. In our study – together with colleagues from Princeton and the University of Madrid – we therefore compare all available measurement data sets since the late 19th century with a simulation of a climate model in which the ocean currents are computed in very high resolution. This model simulation took six months on 11,000 processors (9,000 of them for the ocean alone) of the high-performance computer at NOAA’s Geophysical Fluid Dynamics Laboratory in Princeton. The central result is shown in Fig. 1 (left). The model thus shows a fairly characteristic “fingerprint” of sea surface temperatures as the AMOC weakens. We now wanted to know what temperature changes the observational data show since the late 19th century. My doctoral student Levke Caesar evaluated the various data sets. 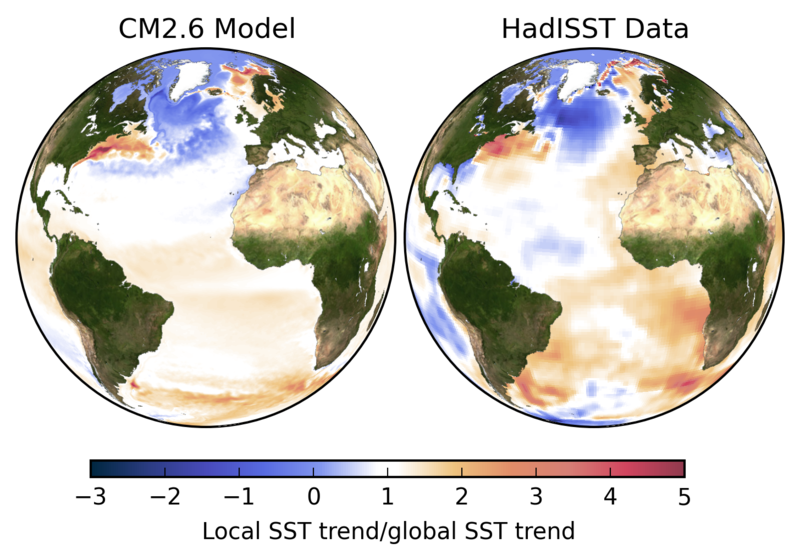 They show a very similar pattern – see the right globe in Figure 1 – and the annual cycle of change – more cooling in winter – also corresponds to that of the model simulation. I know of no other mechanism that could explain this spatial and temporal pattern than a weakening of the AMOC. Such a slowdown as a result of our greenhouse gas emissions has long been predicted by climate models – these data show that it is already underway. Another new study (Anomalously weak Labrador Sea convection and Atlantic overturning during the past 150 years by David Thornalley and colleagues) was published in the same issue of Nature, which supports this finding and places it in a longer climate history context. The authors used two types of data from cores in sediments at the seabed – so-called ‘proxy data’. These deposits gradually accumulate over thousands of years and tell us what happened in the ocean in the past. Naturally fuzzier than modern observations – but reaching much further back in time, in this case 1600 years. The first data series – from calcareous shells of marine organisms that live 50 to 200 metres below the sea surface in the northern Atlantic – shows the temperature conditions there. From these, the strength of the heat transport and thus the flow can be deduced, similar as in our study. A second data series is based on the grain size of the sediments at two points at a depth of 1700 and 2000 metres – where part of the water brought northwards by the Gulf Stream flows back towards the south as a cold deep current. The neat thing is that the current sorts the sediment. Coarse grain size of the sediments indicates a strong flow, finer grain size indicates a weaker flow, to put it as a simple rule of thumb. The authors conclude from their data that the AMOC has never been as weak in all those previous centuries as in the last hundred years. This supports an earlier conclusion of a study I led in 2015, where we had already concluded this for the last 1100 years – based on a completely different, independent database. Below, my interview with ice core expert Jorgen Peder Steffenson, in Greenland, 2017. This is very bad. The agreement with the data is striking. Take it off into the future and total shutdown… and this time, with this level of forcing, might we end up in Peter Ward’s studies results from past mass extinctions, and widespread death by hydrogen sulfide? It’s a nasty way to die. Very bad indeed! McPherson would approve of your “rational fatalism” if he were still paying attention. There is NO good news. The WashPost is my daily paper, and page A2 this morning was nothing but climate change. The Mooney article on the AMOC cited here, and another by Mooney titled “Wetlands may be unable to keep pace with sea level rise” which lays out a bleak picture re: the restoration of the disappearing wetlands in Louisiana. The AMOC article in the WashPost is unfortunately riddled with a lot of qualifiers that are the only thing the Inhoffes of the world are likely to remember—–“suggesting”, “may be”, “I think it is happening and I think it’s bad news” (Rahmstorf), “probably” (several), etc. How bad is it going to have to get before the scientists start to speak as strongly about the truths of climate change as the know-nothings do about the lies and disinformation? As long as no one strongly counters Trumpty-Dumpty’s “Climate change is a hoax”, we will not make progress rapidly enough. A recent editorial in the Post also show the same sort of ambivalence and “wishy-washyness”. There’s still hope? Yeah, sure. I agree with your insight. This has been predicted, but still unsettling news. Having lived in the South West of England and enjoyed the mild winters and palm trees of Devon and Cornwall, a gradual slowing of the bringer of warm currents will be a shock and counter to the warming. As great changes to the European fisheries are happening, what will the slower AMOC activities bring to the already complex mix. This is why we need those supercomputers. “The temperature of Europe’s seas due to climate change is increasing faster than in global oceans, according to the European Environment Agency, and Mediterranean species like bluefin tuna and anchovy, attracted by warm waters, are moving northwards to be observed in some cases, as far north as the North Sea. Excellent summation as always, Peter. Thank you so much for your consistently superior work. I have come to rely on it for its unfailing clarity and integrity. If the AMOC slows down enough to cause severe cooling in northern Europe, there will be one unintended positive consequence. Sir Chucky in Ireland will have to devote more time to digging peat to burn, and therefore will have less time to pester us on Crock. What gets me is the “rate of change”. AMOC 15% slow down since 1950… (There is an earlier report that pegged it closer to 20%, (sorry I don’t have the cite on the top of my head and it’s been a long day). So how fast will the ice sheets on Greenland melt? Any bets on what year the Arctic is a blue ocean in late summer? Joe Romm has had a bet riding for $10,000 on 2020 as <10% sea ice for some years. Evidence suggests that the circulation system of the North Atlantic Ocean is in a weakened state that is unprecedented in the past 1,600 years, but questions remain as to when exactly the decline commenced. The issue is a matter of serious concern. How fortunate the world is to have a Mike Pompeo confirmed as US State Department director helped along by Sheldon Whitehouse. What? Does this mean ocean current turbines are a bad idea? There was a recent revelation that Facebook’s Sheryl Sanders’ conference room was labeled “Only Good News”. This was yet another sad reminder that no amount of methodically collected and well-analyzed data will penetrate an established denial screen, or the human tendency to embrace good news to the extent that it eclipses bad news, and render anyone who wants to point it out as a Big Meanyhead.